I’ve been compensated for this post. Thank you Produce for Kids for allowing me to create this original recipe. I love a good bbq, but sometime it’s more about the sides than what’s cooking up on the grill. Often I can skip the burgers and pile my plate with watermelon, black bean salad, buttery corn, potato salad and macaroni salad. Yep it isn’t a proper bbq unless butter and watermelon juice are dripping down my forearm. The one thing I am quick to pass over is the coleslaw. Limp shredded lettuce drenched in mayo isn’t really my thing. It tastes so bland to me. So I made an easy blue cheese coleslaw just for me. 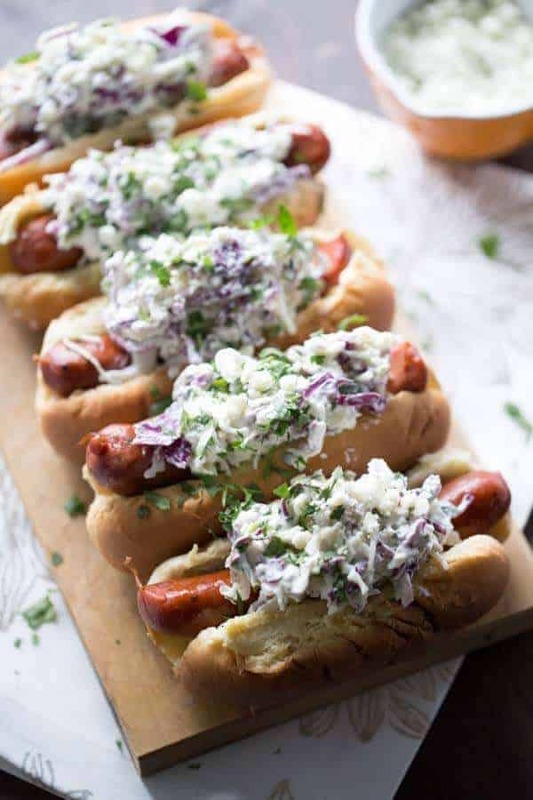 This recipe combines red cabbage, angel hair slaw, Greek yogurt, a bit of mayo, cilantro and of course blue cheese. Blue cheese is one of my favorites! It’s creamy, piquant and compliments the spice from smoky andouille sausage perfectly! 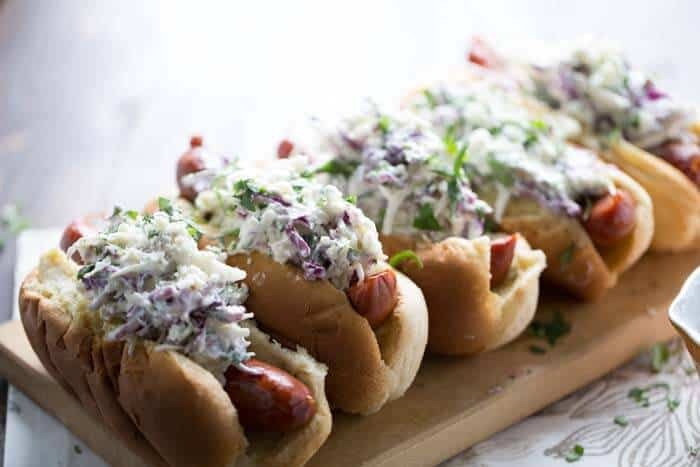 Blue cheese coleslaw and andouille sausage are a happy bbq pair! 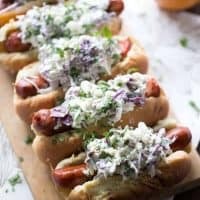 A creamy and tangy blue cheese slaw covering spicy andouille sausage. 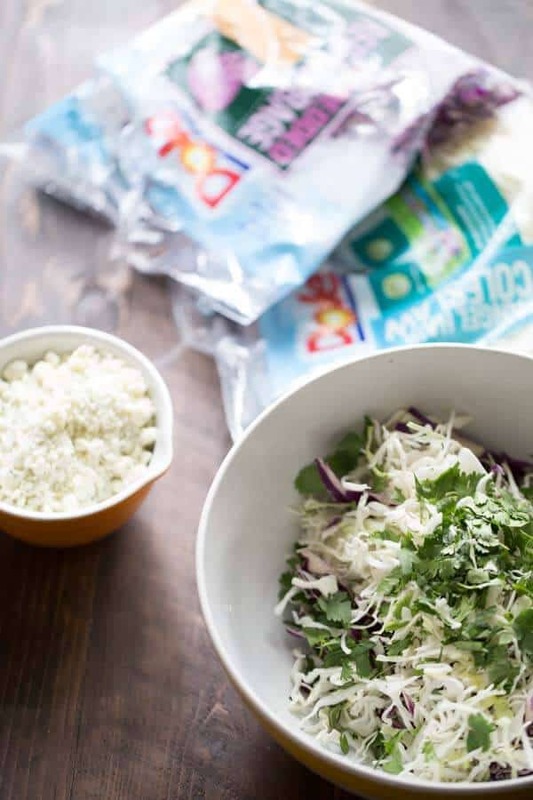 In a bowl, combine cabbage, slaw and cilantro in a bowl. Stir in yogurt, mayo, garlic, vinegar, lemon juice, salt, pepper and blue cheese. Mix until completely combined. Place in refrigerator until ready to serve. Grill sausage for 4-6 minutes until cooked through. Top with slaw and serve. I saw these and nearly shouted “YES!” because they are so the perfect thing to make this weekend! I need that bleu cheese coleslaw on like, everything from here on out. Sounds amazing paired with spicy andouille sausage! Love the sound of the blue cheese coleslaw! Such a great twist to the traditional coleslaw! My family would love this! Thanks for linking up with What’s Cookin’ Wednesday!